A piece of Americana is being destroyed – creatively destroyed. Most of us probably haven’t even taken a moment’s pause to consider the extinction of the entities that once held a predominant place in the nation’s department, grocery, and drug stores. With its banishment, we are approaching a time when a whole generation won’t fully understand why Robin Williams stepped out of his usual comedic roles to star in Mark Romanek’s psychological thriller “One Hour Photo.” I mean, why would you need an intermediary to look at your photos before you upload them to Facebook* – or, conversely, why would you steal someone’s photos when you can anonymously look at them on Instagram? The one hour photo is a victim of technological change. After all, photos were taken to share with family and friends – it was the “status” update of the 1950s to the very early 2000s. Today, our mobile phones are the cameras. Digitization is the modus operandi. Yet, this post is not about the passing of an industry lost to technological change. It is about the impact of technological change on our communities and their workers. Creative destruction – whether it is the demise of a one hour photo department or automation replacing workers at a factory – is the natural progression of our continually evolving technological environ. Communities can either be at the forefront of this change or must adjust their local economy and workforce to the shifting economic tides. Over the last 29 years of my life (i.e. all of it), I’ve developed photos at a store twice – just twice. And it seems that America isn’t as prone to develop their photos at a store either. In 2002, national One Hour Photo (NAICS 812922) employment stood at 11,611 workers. By 2012, total employment stands at just 1,442. An 87.6 percent decline or 10,169 people needing a new line of work. This isn’t an anomaly. Apple, Samsung, Motorola, Nokia, et. al have drastically changed how we take a photo while Facebook, Twitter, Instagram, and Flickr have drastically altered how we share a photo. Without both evolutions, I’d argue, speedy film development would still be a thing. The whole photography industry is reeling from improving mobile phone photo quality, digital cameras, and photo sharing. Employment within the photography sector declined 39.9 percent – 96,845 jobs – over the last decade. Barring some sort of technological change or massive alteration to the sector’s business model (see the first footnote), photography employment is vanishing – it transcends decline. The implications for vanished employment vastly differ from general employment decline – the shift is structural, those workers unable to adjust will almost certainly require retraining to make their skills valuable in the new economic climate. On the other hand, Photographers; Photographic Process Workers and Processing Machine Operators; and Mixing and Blending Machine Setters, Operators, and Tenders; represent a wholly different challenge – skills within these occupations are highly tied to the photography sector and will likely not translate well to other business sectors. When skills don’t easily to other economic sectors, intervention is needed – community stakeholders must coax out retraining opportunities. For ease, we’ll just focus in on Photographic Process Workers and Processing Machine Operators (Film Developers). O-Net – a primary source of occupational information provided by the Bureau of Labor Statics – divides an occupation into its three component requirements: knowledge, skills, and abilities. By comparing the knowledge, skills, and abilities of Film Developers with other occupations, stakeholders can identify occupations with the highest retraining potential. Before you identify which occupations make sense, having a full understanding of the strengths of your local economy will greatly aid identification. For simplicity’s sake, we’ll assume your local economy has a strong semiconductor sector. Film Developers and Semiconductor Processors – workers who manufacturer electronic semiconductors – share many commonalities. In the above graphic displays the knowledge level of Film Developers (knowledge overlap) and Semiconductor Processors (Knowledge Gap). In essence, red represents a gap between Film Developers and Semiconductor Processors. As you can see, Film Developers share some common knowledge sets including Administration and Management, Customer and Personal Service, and Chemistry. Gaps – which can also be seen as retraining opportunities – exist in Engineering and Technology, Public Safety and Security, and the English Language. Improving writing skills, STEM education, and hazardous material handling would assist in retraining Film Developers for employment within the semiconductor manufacturing sector. Film Developers’ skills will also need further honing and improvement. Skill development should be formed in conjunction with local semiconductor employers – skills are intricately tied to place. General skillsets that can be improved in the classroom include reading comprehension, speaking, and social perceptiveness. Equipment maintenance, quality control analysis, and operation monitoring are skills better suited for apprenticeship programs or learning labs that simulate the workplace. Abilities are enduring attributes of the individual that influence performance*** and are far more difficult to teach in a classroom setting – though not impossible. 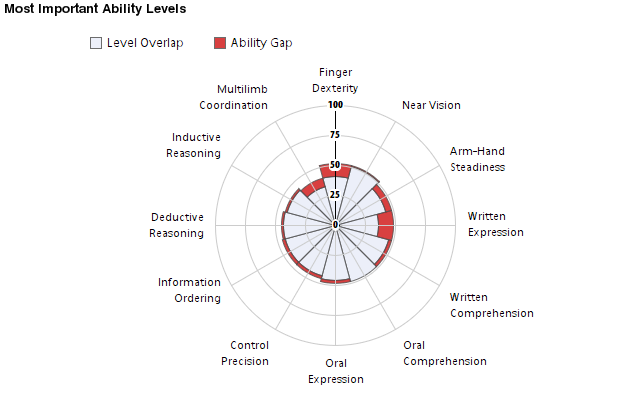 Abilities can be learned and improved over time by repetition. Finger Dexterity, written expression, and multilimb coordination possess the largest skills gaps between Film Developers and Semiconductor Processors, however, few abilities possess significant gaps. Don’t possess a vibrant semiconductor sector? Well, you get the gist. If your community has been unfavorably impacted by the changing economic landscape, or simply suffered a large closing or relocation, the steps are fairly simple to follow – albeit tough to implement. 1. Be Proactive – start – if you haven’t already – the conversation now. Once the event is announced, you’ll be at a disadvantage. Time is critical. A target sector analysis with a robust occupational evaluation and economic development strategy is a crucial step in improving the turnaround time. 2. Identify the best use of resources – separate occupations between those that the market will sort out – i.e. those with the transferable skills – and those in which retraining is a must. 3. 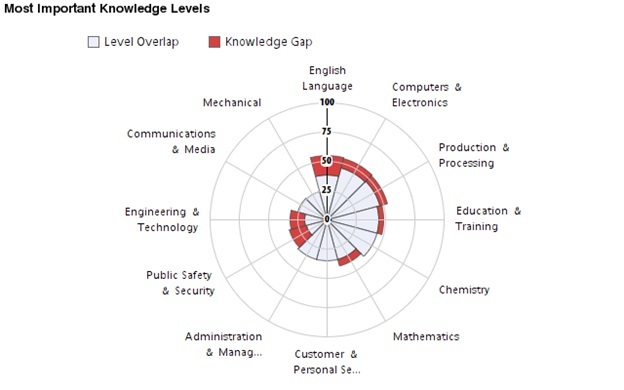 Identify the knowledge, ability, and skill gaps for each targeted occupation – get advice and insight from employers. 4. Work with higher education and Workforce Investment Boards to develop a targeted retraining program – greatly informed by perspective employers’ knowledge and stated demand. 5. Formulate mentorship, internship, or apprenticeship programs for retrained workers – important for “proving” the value of the program to perspective employers. 6. Maintain relationships – this might happen again, so keep the dialogue going. 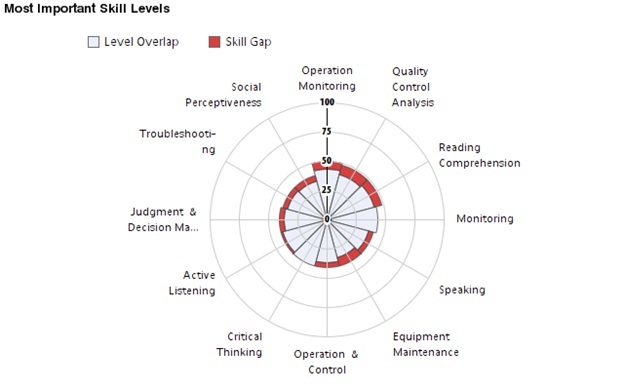 Identifying skill overlap is time consuming, complex, and requires hefty data lifting. However, informed decisions about worker retraining and retooling can greatly improve the ability of your economy to recover from a mass layoff or significant job loss caused by technological change. Of course, workforce development efforts combined with identified targeted business sectors and a holistic economic development strategy will greatly assist retraining efforts. It is about having the processes and relationships to respond to change. It is about building a resilient local economy. * - Admittedly, this might be a useful service for Facebook’s denizens. Consider this free business advice – I require a small, five percent stake. You’re welcome. In August of 2011, I wrote a blog post about film incentives and the ability of the sector to grow jobs. I concluded that the jobs numbers were a poor rationale for continued subsidies, especially in Georgia. I also said that if I ran into “Catherine Heigel, Keira Knightley, or Angelina Jolie,” then I would personally sponsor the next piece of incentive legislation. I would like to revisit the former statement with new data and analysis, but I still wholeheartedly stand by the latter. The discussion revolving around film incentives has waxed and waned in recent years, but there still remains no definitive answer as to the “worth it factor” of these incentives. The competition for feature films is increasing and international destinations such as Australia (“The Great Gatsby”), Canada (“Godzilla”), and the United Kingdom (new installments of “Star Wars”) are rapidly asserting their ability to compete, especially on incentive packages. As Variety reported, the exodus of motion pictures to other shooting locales has prompted the Mayor of Los Angeles, Eric Garcetti, to state the loss of such films is an “emergency” and at the top of his political to-do list. One of the areas of the country that has upped its appeal for filming is the Southeast. As the map below shows, Louisiana, Mississippi, Alabama, Georgia, and South Carolina are among the states offering the highest tax credits. The map, which ran in the Wall Street Journal, accompanied a piece on North Carolina’s film incentives, which are slated to sunset in 2015. Rep. Mike Hager, the GOP majority whip, is perturbed by the opportunity cost of $70 million and was quoted as saying, “We could have paid more teachers, kept our teacher assistants, given raises to our highway patrol.” It is unclear whether sunset provisions for film incentives are becoming a trend, but states such as Texas, California, and Nevada have increased their overall funding for incentive programs. 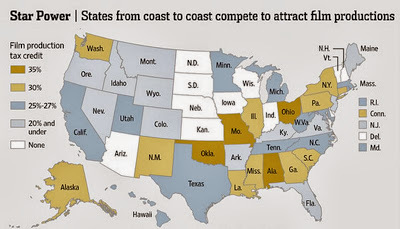 Note: Restrictions on tax incentives vary by state. States differ in the mechanism for paying incentives. Tax incentives may be capped, and also may be limited to specific areas of a film’s budget. In my previous post, I looked at jobs in the motion picture and video sector (NAICS 512) and the onset of incentives programs to see if there were any correlations. The continued loss of jobs in Georgia, even after the beginning of the film incentive program in 2005, was the main takeaway. However, Market Street has recently acquired EMSI, allowing for more in-depth study of different sectors. The following table shows the current status of jobs, earnings, and multipliers for a range of Southern states and California in motion picture and video production (NAICS 512110) and teleproduction and other postproduction services (NAICS 512191). 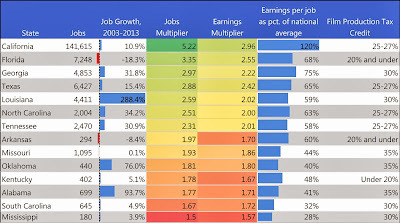 Note: LQ is the “location quotient” and measures the concentration of jobs in the state relative to the nation. A score of 1.0 indicates that the employment has the same concentration as the average community. Location quotients above 1.0 indicate more concentration (and conceivable a competitive advantage). Overall, the film incentive debate is still murky. 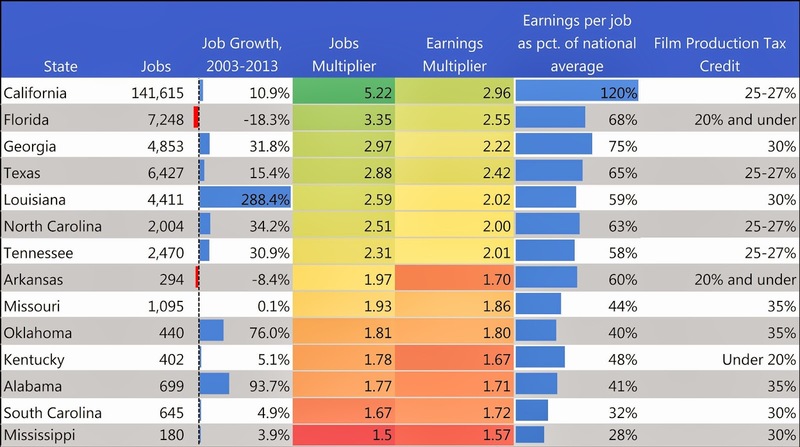 Higher tax credits are not correlated with more jobs or higher multipliers. 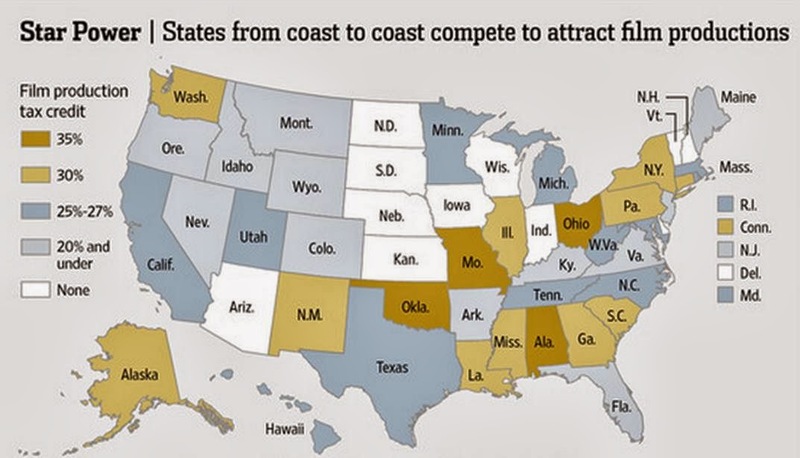 But on the other hand, some states are seeing growth and economic activity derived from the sector. What we don’t know, and it’s a central question, is whether or not film incentives are the best option, politically and fiscally. Until we can answer that, film incentives are likely to stay around as long as the Fast & Furious franchise… number 7 is being filmed in Atlanta now! Lifelong Learning: A Cure for the Displaced Worker? It’s been a familiar story over the last few decades. A manufacturing operation in Anywhere, USA shutters its facility in favor of a low cost labor country which increasingly isn’t in China. The impact upon the community – depending upon its size and economic mix – ranges from significant to catastrophic. For the local community, the loss ripples throughout the economy, undermining the financial health of suppliers, grocery stores, and retail outlets. To the dislocated worker, the impact is far more personal. If they are able to find employment again, it will likely bring a lower wage. The Bureau of Labor Statistics finds that roughly 44.0 percent of workers dislocated between 2009 and 2011 reported lower earnings at their new full time position – wage impacts can also spillover to their children’s future earnings potential. If the dislocated worker is unable to find work, the effects are grimmer. Over a two-year period – 2009 to 2011 – 12.8 million workers were displaced from their jobs according to a Bureau of Labor Statistics survey released last year. Plant closure (30.8 percent), insufficient work (39.5 percent), and position or shift abolished (29.7 percent) shared nearly equal responsibility for worker dislocation in the United States. For long-tenured workers – 44.0 percent remain unemployed – finding work will be challenging as their acquired knowledge and skillsets are intricately linked to a specific position, facility, and company. Much of what they learned over their tenure will likely be discounted by other firms or easily replaced by an incoming young, malleable workforce. While retraining programs and offerings at a local community colleges will serve to assuage a plant , they do little to address the structural issues embedded within a progressively flexible and evolving labor market. Fortunately – or unfortunately – the path towards adaptation is incumbent upon the willingness of each individual to continually seek out opportunities to improve one’s skills and acquire new knowledge. Arguably the best – most cost effective at the very least – continual learning avenue is the Massively Open Online Course (MOOC). MOOCs offer college level – albeit usually entry-level – courses for free. Many of the nation’s top universities offer at least one MOOC: Stanford, MIT, Georgia Tech, and University of Michigan are just a few of the nation’s universities exploring the new education medium. Course offerings cover a wide swathe of topics ranging from global health to quantum physics. MOOCs have low barriers to entry (re: free) and provide an avenue for local communities to establish themselves as lifelong learning regions – promoting continual learning within the workforce and developing programs that support it. Admittedly, the courses offered by MOOCs lean heavily toward the professional services, information technology, engineering, and business management worlds where many positions already have a four-year degree requirement. Coursework in plumbing, carpentry, welding, or any traded profession is woefully underserved. To make up this gap, local stakeholders may work with community colleges to offer freely available courses that tailor to the local economic composition. Have a large manufacturing facility? Welding or product assembly might be a departure point. Have a huge medical hospital within the community? Introductory courses in radiology or nursing may be a better fit. The goal is to reduce the potential resistance for local workers to attend, reskill, or acquire new knowledge – offerings should be provided for free or at material cost. The MOOCs model not only reduces the friction to continual learning, it rewards the exploration of new topics. You can easily take any course that piques your interest. Bioelectricity your thing? The fact that you’ve never completed a Calculus course bother you? Haven’t completed high school? Signing up for a course is just a click away. The fear of failure is all but erased as a consequence of “free.” When combined with a degree of personal responsibility and willingness to complete the course, the freedom to be an undergraduate student in the normally expensive “exploratory” phase is opened up to average folk. Time is critical for the displaced worker. The Urban Institute finds that one’s chance of being called back for an interview declines by 45 percent as you move from one month of unemployment to eight months of unemployment. Just for an interview. Forty-five percent. Almost half. Continual learning for the displaced worker will ensure their current skills are relevant and up-to-date, thus closing the gap between themselves and the newly graduated. It also likely hastens the speed at which they may decide to shift to another profession. Displaced from the manufacturing plant? Maybe that course on network security was convincing enough to pursue a two- or four-year degree in the field. In a continually evolving economic climate, adopting a lifelong learning approach to workforce development ensures that local workers are flexible, lessening the potential impact of any one firm closure or position elimination caused by technological change. Workforce adaptability and malleability is the key towards lessening the impact of worker dislocation.